…[Delta is] doing a better job than we can today of making sure this sell-up activity is available to the customers. They have products that are there where people buy, and they’re available in channels that we don’t have it available in yet. So we view that as upside. Anyone can sell a ticket, and really, anybody can slap on a bag fee. What’s really hard, however, is finding a way to upsell people and have them still like you for it. Delta’s has been leading the charge in this area to the point that other airlines have become jealous. Some of these upsell opportunities are very visible, like paid upgrades. Delta is now selling about 60 percent of its domestic First Class seats in one form or another. That’s up from 13 percent just a few years ago. Naturally, not everyone loves this. Elites, for example, don’t like that their chances of upgrading for free have dwindled, but they also aren’t abandoning the airline. Instead, they’re probably just paying to upgrade themselves if the price is right. That makes Delta happy. Upgrades are big money, and the benefit Delta receives by making it easier for people to actually purchase an upgrade has been huge. Since Delta launched the ability to pay for upgrades after ticketing on any seat last year, revenue has exploded. Year-over-year, Delta saw a 19 percent increase in premium revenues on only a 3 percent increase in seats. But as Delta CEO Ed Bastian said on that airline’s last earnings call, they aren’t done. That’s what we’re excited about in the future is the ability to control your travel and upgrade however you want to with whatever currency you want to use. So you want to – if your company buys you a coach ticket and you want to sit in the Premium Select cabin, we’ll have an offer for you that would be 17,000 miles for you or it’s a $170 in cash. So those kinds of offers are really where we’re trying to go with all of that in making it simpler to buy or easier to buy and allowing you to buy it however you’d like to pay for it. But wait, does this even make sense? If Delta is getting a lot of revenue by selling these upgrades, then why would it want to let people use miles for them? It’s because to Delta, miles are money too. So the answer is that clearly it comes through different line items, but the revenue is real whether or not you pay with cash or whether or not you pay with mileage. And that’s one of the things that we’re really excited about is being able to let you do that on your app on the way to the airport. And it doesn’t matter to us how it comes through the P&L because it’s real revenue either way and what we need to do is continue to have your affinity grow there. Delta makes hundreds of millions of dollars off its mileage program. All those points you earn from your SkyMiles Amex? Delta gets paid. Did you transfer points from Amex to Delta? Delta gets paid. Outside of miles that Delta awards for flying itself, Delta gets paid. The key is just setting the right conversion rate so that Delta becomes indifferent to whether someone uses miles or money. In that sense, Delta is no different than, say, Capital One. As we’ve all heard Jennifer Garner tell us, you can redeem your points on any airline with no blackout dates. One point is worth one penny of paid airfare. Delta has a formula where miles = cash, and at that conversion rate, Delta is happy either way. In the upgrade offer I posted above, it looks like each point is being valued at 1.075 cents. For a traveler who prefers to redeem miles the old way, this is frustrating. In a traditional program, mileage redemptions are scarce, but they’re a good value when available. But year after year, the airlines have devalued those points. Now, they’ve been devalued enough where Delta can consider them an additional currency to be used for far more things. The high-value redemption rates will keep disappearing, but there will far more opportunities to redeem miles at a lower valuation going forward. Many travelers are likely to view that step positively. With the ability to redeem in new ways, Delta has been able to restore some value to its program, but mostly it’s just found a way to extract more miles from people to pay for ancillary services. And remember, for Delta, miles are money in the bank. As a customer, if Delta is pushing miles to the point where they are worth one cent (or 1.075 cents), why would I get, and more importantly to Delta use, a SkyMiles credit card instead of one of the many cash back credit cards? With no annual fee, one cent per dollar is pretty easy to find, and two or more cents is not too difficult to find with a fee. So it really surprises me that this is feasible long term; it certainly doesn’t seem rational for customers. Even if you want the high annual fee Delta co-branded card for checked bag fee waivers or lounge access, you’re better off using a one cent per dollar spent cash back card for non-Delta spend than earning miles on Delta. So with the exception of earning elite qualifying miles, it’s pretty remarkable that Delta is so successful raising revenue this way. Alex – You can be sure that if Delta started losing cardholders rapidly, it would find a way to add more value back in. But it doesn’t see this in the numbers, so it keeps plowing ahead. Absolutely; based on Delta’s behavior, I’m sure they don’t see it in the numbers. I just don’t get it except for the elite qualification aspect (which I think is a secondary driver of credit card spend on affinity credit cards, though it’s possible I’m wrong). Two percent cashback cards without annual fee are not hard to find. You don’t have to look further than Citi’s Doublecash card. If you use a card that earns you a single Delta mile for a $1 purchase and then use it to purchase an upgrade as shown you are leaving cash on the table. The only reason I could justify using Delta miles for such an upgrade is if they were earned while flying Delta and if there was really no more valuable award redemption available. Charging your way I to First class via credit card miles is not a fiscally responsible decision. I do have the base Delta Amex card, for bags benefits primarily. I don’t charge a dime to it, though (exception: if it qualifies for an Amex Offer that none of my other Amex cards has). Alex, does Delta award Elite Qualifying Miles on credit card spending? Or are you referring to Elite Qualifying Dollars? Yes, you can earn both elite qualifying miles and elite qualifying dollars (or a waiver of the requirement) based on (high levels of) spend on (some high-annual-fee) Delta credit cards. Disagree with your premise. I have a general cash back card and a bank travel card but I still use my Delta Amex card a lot and here’s why: while miles are generally valued at around 1 cent per mile (The Points Guy says on average 1 Skymile is worth about 1.5 cents), Delta does not always correlate the skymiles price for a flight and the cash price. For example, if you find a great deal like a roundtrip Europe flight for $500 then you can use cash back or a capital one card to buy the ticket with your cash back or your points. But sometimes a $1000 Delta flight will be sold for 45,000 skymiles for example (often flights to London from Atlanta for example). Also, Delta does skymiles only deals and flash sales. I used one of those flash sales to get a roundtrip ticket Atlanta to Beijing for 34,000 skymiles but the cash price for a ticket on the smae flight was still about $900. I live in Atlanta (a Delta hub) so Delta does not have much competition or incentive to do cash deals but they do have skymiles deals. If you live in a city like Boston or NY with lots of airline competition then cash prices will be lower so you might get less value from skymiles but it’s always good to have options! Sure, that’s the case right now; you’re finding Skymiles value that considerably exceeds 1.5 cents per mile. But my premise is that if Delta’s goal is to push the value of Skymiles down to 1.0 cents, customers won’t be so drawn to the card and AmEx wouldn’t be willing to pay Delta nearly as much for it in the long run. Suppose you’re that same corporate traveler whose company pays for coach and you want to pay the fare difference for first on American. First, you can’t do anything on the website, you must call. Unless you have top tier status, be prepared to wait a while for an agent (even as Executive Platinum wait times have increased substantially the last few years). Once you’ve gotten through and explain to the agent what you want to do they quote the difference. Sometimes they price it correctly, sometimes they don’t, if they don’t then it’s time to hang up and call again. American will waive the change fee if you are upfaring, but again, most of the time the agent is aware of this, but sometimes not. So in that case you need to escalate to a supervisor or hang up and call back. Oh, you booked through a corporate travel agent? That will be a $25 fee for them to do this (unless you’re a top tier flyer). Booked an agency specific fare, in that case they won’t even touch it. Sometimes it amazes me how difficult some companies make it to give them money. AA Agent here… I promise we feel your pain. The policies have become so complex they are difficult to keep track of, even with our manuals. I have the pleasure of working in a specialty department (I mean that; I enjoy it.) so I also take backup regular calls. That just means that I have to keep track of twice as much. We also wish things could be simpler so we could better assist you. We really do want you to have a good experience. In Delta’s attempt to have people pay for first class, I have noticed a decrease in first class fare charged (G,A) on some routes. The price difference among coach, econ+ and first has narrowed quite a bit. If you’re buying your own ticket and booking out a few weeks/months, this can be a good deal. I get all these emails from Amex to get the Delta credit card. I laugh. Unless you’re using the card’s annual fee as a prepaid way to avoid paying for checked luggage, there are much better credit cards to put spend on. Much much better. Didn’t United just upgrade their card recently yet I believe that I saw they recently reported that the card is still underperforming? People are waking up. If they don’t get rid of these airline cards, people use them less and less which sure can’t make Chase and Amex happy. The revenue based programs have made being anything other than a ‘free agent’ chasing the most convenient, cheap fare a foolish act. All the while airlines plan the next devaluation. In my opinion the ‘golden goose’ is quickly becoming an ‘ugly duckling’ to those paying attention. Again, you’re right that for general every day use, it’s better to use a double cash back card but the main selling point of an airline card is the initial sign up bonus which is often way higher than for cash back cards. Also, if you get a lounge discount then those savings add up quickly. Speaking specifically about Delta Amex, I alternate between using that card and my other cards for general spending because Skymiles can often be redeemed at a higher rate (such as flash sales or deals where you can get a ticket with miles for a portion of the cash price). Also, the airline knows that you’re a card member and it’s printed on your ticket so they will generally treat you better and, for example, a non-member will likely be bumped from a flight before you. You would think that AA and United would do the same thing soon. After all, their business model is “copy Delta”. No crud AA is way behind the game. I pleaded to a gate agent to let me buy an upgrade on a flight that would go out with 4 empty first class seats. But because I was on an Alaska issued ticket, AA doesn’t have a policy/way to buy an upgrade. So what AA did was refuse my offer for $150 to sit up front. Stupid. The AA Agent couldn’t have done it even if you weren’t on a codeshare. Purchased upgrades are only offered electronically at checkin, whether or online or at a kiosk. The price is determined by an algorithm in the background. If you miss the opportunity or decline it at checkin, you will not get the opportunity again. There is currently NO WAY AT ALL for any human employee to help you. What’s really odd is, legacy US had this functionality at the gate, 5 years ago. I remember a connection from CLT to MSY in 2014 where the gate monitor was advertising $99 upgrades to first class. It’s crazy that the AA management team (who mostly came from US) haven’t implemented this, given how much they did bring over. I remember those US gate upgrades. I took advantage once or twice when US was part of *A and I was traveling a lot for work. If I was exhausted and the price was right, I’d buy it. Another monetizing opportunity: A couple of weeks ago Delta offered me to buy Silver Medallion status for $599. I had already qualified based on miles, but I’m currently $498 short of qualifying on dollars. Chances are that a mileage run for status (or more appropriately a dollar run) would cost somewhat more than $498, so I guess $599 is a reasonable price point for someone who was considering the run but doesn’t really want to take an unnecessary flight. Plus, the $599 would buy me a few extra Medallion qualifying miles and segments, which are useless for this year but would presumably roll over to next year. I did not accept Delta’s offer: I don’t value Silver status that much, and I never considered a dollar run in the first place. I’m not sure what my price point for Silver status is at this time, but it’s well below $100. But for those who would consider a dollar run for status, this offer by Delta looks like a win-win situation. I probably would’t pay $599 if I was as $0/0 MQM. It just doesn’t strike me as worth much more than what I pay for my basic Delta credit card. Free alcohol in Comfort+ was always the selling point for me. 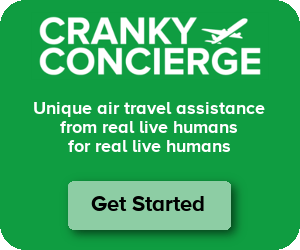 Cranky, United has been doing this for years. When one buys a ticket on United, one can either pay for a discounted first class ticket (the old “A” class) or can elect to purchase the immediate upgrade when it flashes on the screen before the transaction closes. I used to be able to count on an upgrade because United did what American is doing and did not yield manage the first class cabin. Now, it appears they are and I’ll bet anything, as you point out, the PRASM on the first class compartment is infinitely higher than it used to be when everyone had upgrade coupons. I’m a 1K and MMF on United and it will be a cold day in a very warm place before I get upgraded, unless I buy it. For the frequent flier, this is a better system. It’s certainly fairer. I have been an AAdvantage member since the program began, and have the miles to show for it. Back in the day, I could book an upgrade eligible economy fare on American, call the AAdvantage desk, and use my miles for an immediate upgrade. Or call and just book the whole thing on the phone (because there has never been a way to do it online). But now, that seems impossible. American practically insists you wait until check in to request the upgrade, then roll the dice that travelers higher up on the food chain don’t beat you to it. I’m claustrophobic and can’t handle the crush. I need that guaranteed premium seat. So lately, I’ve been just buying a front of the plane ticket. But… if I’m paying all cash, why continue my loyalty with American? If they’re making it so hard to use my miles, why bother adding more to the pile? I’m sure Delta or United (ugh) will happily take my money for a revenue seat. And I’ve now expanded my scheduling opportunities. American needs to understand loyalty runs both ways. American’s president laments Delta’s success, but doesn’t sound like he’s made a priority of getting AA on the same page. Coach airfare adjusted for inflation continues, as it has for many decades, to get cheaper, but also more cramped as people get taller and wider. More and more people will pay for more legroom, wider seats, premium economy, first class etc. Like others I find airline miles are often only worth about a penny each so 2% cash back or the Chase Prime Reserve card with essentially 4.5 cents back per dollar on travel and restaurants becomes more attractive than airline card unless the airline card comes with tens of thousand of miles for an initial spend, after which the card is put away or cancelled. One thing some airlines still have that favors collecting miles from credit cards is that in some cases a close in time flight is a much better deal with miles than cash, but this seems to be on the decline as discount airlines often don’t play this game. I was hoping you would write about this! AA ExecPlat here and DL Platinum. Have definitely used the Delta feature to pay for an upgrade when I wanted first and the company would only buy coach. Love thr convenience (online) and expense report cleanliness (upgrade on my card, no messy separation of personal v. business). Cranky, what do you think is stopping American? Technology? Figuring out the pricing? Something else? CP – Tech. AA has poured its tech resources into integration. Now that the last big integration project is done, they can start redirecting resources toward actually putting out things like this.